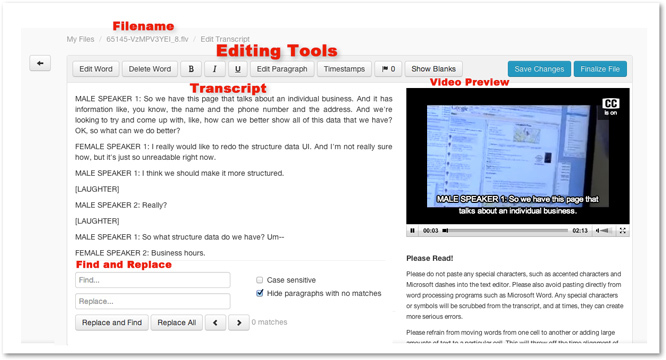 This tool is intended for making basic textual edits to your transcript. DO NOT EDIT YOUR FILE IF A TRANSLATION HAS BEEN ORDERED AND IS NOT YET COMPLETE! Basic adjustments to the synchronization between text and the media file can be made by moving words to available blanks and deleting them from the original location. Save your progress by clicking Save Changes. Click Finalize File after proofreading your edits to have the changes propagate to your 3Play Media file. If you'd like someone to edit a file but you do not want to grant them access to your account, create an Expiring Editing Link (EEL) for your translation. If caption requests were submitted using one of the platform integrations with auto postback captions turned on, the edits made to a file using the Edit Transcript tool will propagate to the captions residing on your respective platform shortly after when Finalize File is clicked. Please scroll to the bottom of this article for other important warnings. Locate the file from the My Files page that wish to edit. Click the file's name to open the file show page. Click the Edit Transcript icon located above your transcript. Once the transcript has loaded in the Edit Transcript interface select from one of the available actions or tools. Here are the available editing and styling modes available using the edit transcript tool. Please note that Font styling (bold, italics, and underline) will only appear in the downloadable HTML transcript version of your file. Click a word in the transcript you would like to edit. Once clicked, the word and others associated with that timestamp will become editable within a text field. Edits made to words will be indicated in green. After editing words in your transcript click the Edit Word button to deactivate editing mode. Click a word in the transcript to delete it. Click the word again to undelete it. When you are done, click the Delete Word button to deactivate this editing mode. Click a word in the transcript to make it bold. Click the word again to undo the bold styling. When you are done, click this button again to deactivate this styling mode. Click a word in the transcript to make it italicized. Click the word again to undo the italicization. 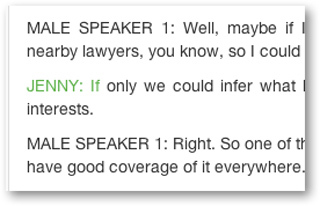 Click a word in the transcript to underline it. Click the word again to remove the underlining. Hover your cursor over the word where you would like to create a paragraph. Click this word to create a paragraph break. If you are unsatisfied with where you made this edit this can be undone. To undo a paragraph break you just created, click the word again to revert to the word's previous position. When done creating paragraph breaks, click this button again to deactivate this editing mode. PRO TIP! If a caption frame hangs for too long, the timing can be edited by creating a paragraph break using this editing mode. The Replace and Find tool is a great option for making edits to words that occur in one or multiple places in your transcript. You can also use this tool for the Find functionality to locate a word in your transcript without having to replace it. To locate a word in your transcript, enter the word into the Find field and press enter/return on your keyboard. The number search result matches will be listed to the right of > button. By default all matches will highlighted in yellow within your transcript and you can navigate to the different returns by clicking either the < or > button within the Replace and Find tool. To replace a word found in one or multiple locations in your transcript, enter the replacement term in the Replace field after completing your initial search. Each Find result will be highlighted in yellow in the transcript preview. Click the left or right arrow buttons to navigate through your search results. When you have navigated to the search result you would like to switch with the word in the Replace field click Replace and Find and the word from the Replace field will appear in place of the selected search result. The newly added word will appear in green. The word entered in the Replace field will be listed under the Modified column. Exchanges all instances returned in the Find field with the word entered in the Replace field. An alternative to the Replace All button is to replace the original word in your transcript with the new word on a case by case basis. To do this simply click Replace on the row that corresponds to the instance you want modified. Once Replace is clicked, the term in replaced and highlighted in green in your transcript. Click the Timestamps button and a pop-up menu will appear prompting you to choose how often you would like timestamps to appear in the Transcript Editing interface. The option Show stamps every 10 seconds can be changed to your preferred interval. Once you have selected your preference, click Close and the timestamps will display throughout your transcript. Please Note: Timestamps displayed in the Transcript Editing interface are for reference only and do not propagate to the actual file in your 3Play Media account. If you need a version of your transcript with timestamps included, the Stamped Doc version of your file should be downloaded from your account. Check the box Show Flags to display flags and [INAUDIBLES]s left by transcription editors denoting words that cannot be heard or confirmed. If flags have been left in your transcript a count of occurrences will display to the right of the Show Flags check box. Click Show Blanks to display time points in the transcript where no words were transcribed. Blanks can be edited just like the words in your transcript. Each blank is roughly 1 sec long. Click Save Changes to save your progress within the Edit Transcript interface. The edits will only propagate to the actual 3Play Media file on the My Files page once Finalize is clicked. Proofread the edits made to your transcript. The words that were changed in Edit Transcript interface will be denoted in green. Once satisfied with the changes made to your transcript, click Finalize File to have your edits propagate to the 3Play Media file listed on the My Files page. From the My Files page your file will be temporarily unavailable for download and other actions until this process has finished. Please do not paste any special characters, such as accented characters and Microsoft dashes into the text editor. Please avoid pasting directly from word processing programs such as Microsoft Word. Special characters or symbols will be scrubbed from the transcript, and at times, can create more serious errors. Please refrain from adding large amounts of text to a particular cell. This will throw off the time alignment of the text to the media file.